Should You Squat Tall Athletes? One thing that truly bothers me about our industry is black and white statements, all-encompassing statements. If you look at it from a global view, everything we do is a shade of gray – there are rarely “good” or “bad” things to do. Now before anyone runs with this and says I’m slamming Mike Boyle, that’s not the case at all. In fact, I have a deep respect for all of Mike’s accomplishments and accolades over the years. However, I do fundamentally disagree with the above statement. I don’t know about you, but I’m tired of succumbing to the tired, old mantras in sports. And with regards to this article, I’m tired of hearing that you can’t, or shouldn’t, squat tall athletes. 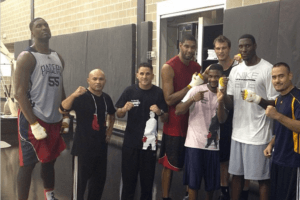 Over the years I’ve been lucky enough to work with a ton of high-level, tall athletes. In our off-season basketball program this year, we had six guys that were either playing professionally, or on their way down this path. Furthermore, I spent a fair amount of time training a 7’2″, 15-year-old SOPHOMORE that epitomized being a “tall” athlete. And you want to know the crazy thing? Now each one was unique, I won’t deny that. Some had pretty good squats on Day 1. Others were a bit more challenging, but have slowly and surely improved into very skilled squatters. Is an exercise “worth it” to a given athlete? If so, you must determine the best ways to build that movement skill for that individual athlete. At the end of the day, athletes don’t get paid to squat, bench press or deadlift – they get paid to play a sport. In our world, it’s really all GPP. And just because I thought I was an outlier, I followed up with a handful of my connections in the basketball world at both the collegiate and professional level. In the college ranks, you have guys like Josh Bohnotal (Purdue), Cory Schlesinger (Stanford), and Ryan Horn (Wake Forest). At the professional ranks you have guys like Eric Oetter and Chris Chase (Memphis Grizzlies), Mike Irr (Golden State Warriors) and Mike Roncarati (Atlanta Hawks). Want to know one of the common threads? All of their athletes have a squat somewhere on the training menu as well. So if it’s good enough for high level athletes at the collegiate or professional ranks, shouldn’t it be good enough for us? Should You Bother Squatting a Tall Athlete? As a coach, we always have to ask ourselves whether what we’re doing is a good use of our time and energy. What does squatting DO for our athletes? And your answer(s) to that question will probably dictate whether you choose to squat your athletes or not. I’m a big believer that squatting does a ton of good things for our body, so here’s my short list. But when you took them into a true squat position with the torso vertical and the knees moving forward, they would shake like a leaf. If an athlete is so “quad dominant,” how on Earth are they getting crushed using just their own body weight for a squat? Furthermore, the quads are great for producing force, but actually quite weak when it comes to absorbing force. And that, my friends, is one of the reasons we have so many injuries these days. Whether we’re talking soccer, baksetball, or football, the ability to break down, change levels, and absorb force are all critical elements of not only sporting success, but reducing the likelihood of injury as well. I’m on a roll here, so let’s look at point #2…. If you’re of a certain age, you’ll know there was a time in our industry when “triple extension” was the holy grail of human movement. If you could extend the ankle, knees and hips successful, you were going to be a dominant athlete. I’m being a bit facetious here, but triple extension is something that we’ve long chased. I’m all for triple extension, but can an athlete demonstrate triple flexion? It sounds easy, but test a bunch of your athletes and let me know how it goes. I guarantee you, it’s not as easy as it sounds! Again, the ability to triple flex reflects our ability to absorb force and change levels. If you’re interested in loading the body more effectively, and distributing forces across a lot of different areas, I think the squat can help you do that. As I’ll describe here in a bit, many athletes struggle with what I call the “trifecta” of poor positioning. But one of the biggest issues, and one that I feel many still fail to discuss, is the concept of center of gravity (COG). If an athlete is anterior weight bearing all the time, this is going to rob them of their mobility, rob them of their ability to flex, and in the context of this article, rob them of their ability to squat. 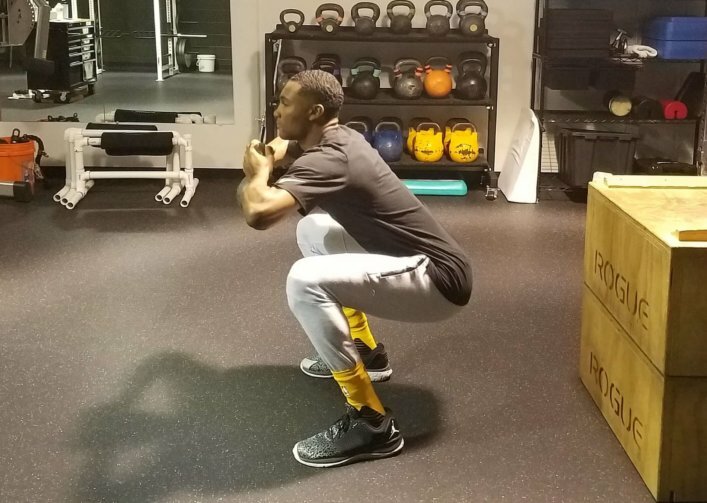 What many of my tall athletes find is that when you teach them to shift their weight back, to feel their whole feet, and to better manage their center of gravity, their squat improves almost instantaneously. And you want to know what’s really cool? When an athlete learns to better manage their center of gravity, a lot of the issues they had initially (such as a stiff lower back, cranky knees, or the always problematic “poor ankle mobility”) tend to magically disappear. So suffice it to say, I’m going to teach all of my athletes to squat. Now let’s talk about the big problems we have to address, and then real-world solutions to help every athlete you coach squat more effectively. Many athletes that you see come into the gym deal with the same basic issues. You will see this in athletes of all shapes and sizes, but it’s definitely more prominent in tall athletes. Quite simply, gravity has a much bigger impact on you when you’re 7’2″ versus when you’re 5’5″! But before I move on, let’s do a simple exercise together to show you how this trifecta works against your ability to squat. Please, take a moment and play along here. Start by taking your feel out wide, placing your hands up by your shoulders (like you’re going to back squat), and then arch as hard as you can. Inhale, puff that chest out, and arch – hard. Now squat as low as you can. Get a feel for how the movement feels in general, and how much mobility you have access to. Got it – good. Now let’s try a different approach. Now I want you to unlock your knees and feel your whole foot. Reach your arms out as far as you can in front of you, and exhale slightly. Now, try that squat again. Did I magically improve your mobility? Sort of – but not really. All I did in this case was improve your position, and allowed you to unlock your body’s natural mobility. Once you understand the power of position, you can start to address the issues these athletes have via smart resets/correctives, and then choosing the right strength training exercises. This is coming from a guy who has lifted heavy weights for the bulk of his adult life, and trains some of the biggest savages on the planet at the NFL level. If a guy like Coach Kenn can reflect and recognize that there are numerous ways to get an athlete strong, or to improve their performance, why can’t all of us? So rather than belabor this point, let’s talk about the real fix to this issue. The first step to getting an athlete to squat better is to “unlock” their natural mobility. In this case, it comes down to optimizing position before we train. To do this, I’m often going to use exercises that engage the abdominals and hamstrings. The hamstrings are responsible for pulling the pelvis back to a more neutral position, as well as “pulling” the pelvis back (i.e. pulling the COG back). Furthermore, the abdominals work to “close off” the front side of the core. Whether it’s pulling the rib cage down or pulling the pelvis up, when we get things back in the right position, a lot of good things happen. Now keep in mind, there are tons of ways to do this, but here’s one of my favorite moves. Lie on your back and hold a kettlebell in both hands. Your hips and knees should be flexed, with the feet resting on a small box. From this position, attempt to feel the whole foot, but especially the heels. This will engage the hamstrings. Now this is the most boring video of all time, but simply inhale and exhale in this position. Focus on reaching long with that exhale. The more you breathe, the more you should feel the lower back relax, and you should get more and more recruitment of the abdominals and hamstrings. Again this is just one example, but suffice it to say that every session is going to start with exercises or “resets” that optimize position first. The second step in the equation is working to cement that position. One of my biggest issues with how people use “corrective exercises” is that they perform the right exercises up front, but then never work to load, stabilize, or express that pattern down the line! Let’s say you do a targeted breathing exercise, with the goal being to get the abs in a better starting position. Well, sort of. The next step is to actually train the abdominals to hold that position against progressively more challenging postures and positions. That’s one of the biggest reasons I created my Complete Core Training product. You can’t just randomly pick and choose your exercises; you need to systematically progress them in a fashion that allows your athlete to be successful. Cementing position can be done in numerous ways, and I’m a big believer that if you have a very extended athlete, you need to address that on numerous fronts throughout the program. But setting position and then working to cement it is going to give you a huge return on your investment. If we want an athlete to squat well, at some point, we have to teach them to squat. The key here is choosing the right squat for the athlete standing in front of us. A lot of our taller athletes would absolutely fall to pieces using a back squat on Day 1, so we need to pull a different tool from the toolbox. Remember that these athletes struggle with the Trifecta of poor position – anterior tilt/lumbar lordosis, extended thorax, and an anterior weight shift. So to address this, I’m going to choose exercises that allow me to correct all three issues simultaneously! And if an athlete still can’t do this while maintaining a fairly neutral spinal posture, I will go one step further back and elevate their heels using a slant board. Don’t worry – their knees aren’t going to spontaneously explode, and chances are they’re going to be shocked at how good the movement feels. Once an athlete has built a decent plate/reaching squat, then I can move them into what I call reaching goblet squats, or even 2-KB front squats. The key here is in the coaching and cuing of the exercises, which I’ll detail below. The final piece of the puzzle is coaching and cuing the squat effectively. I don’t know about you, but I learned to squat maximal weights as a powerlifter – not to build general athleticism and performance. I was taught to lock the knees, shift the weight back to the heels, arch the chest and lower back hard, and to inhale and push out into the belt. And remember – we tried this above. It absolutely makes you strong and stable, but it robs you of your ability to express your body’s natural mobility and athleticism, which I think are pretty darn important when it comes to sports performance. If we want to change how an athlete moves, we don’t just choose the right exercise, but we must coach it more effectively as well. Unlock the knees and feel the whole foot. This will naturally stack the rib cage over the pelvis, and get them in a better starting position. Reach! Whether it’s a reach squat where we’re making the arms long, or a 2-KB front squat where we’re reaching through the elbows, that reach drives the center of gravity back. Sit DOWN. I know this is blasphemy, but I actually want a squat to look like a squat. I want the torso upright, the whole foot on the ground, and the knees driving forward over the toes. In some cases, I may even cue an athlete to flex the knees first to smooth the pattern out (see video below). By using the above approach, I’ve had tremendous success getting all of my tall athletes to squat with great proficiency. Do you have to squat your tall athletes? However, I think there’s a ton of benefit to getting tall athletes to squat more effectively. Whether it’s learning to flex the body, improving the ability to absorb force, or simply the improvement in overall athleticism, I firmly believe that teaching a tall athlete to squat effectively is one of the most important skills you can teach them as a physical preparation coach. * Yes I see the hypocrisy here. I would never say that I will squat every single tall athlete I ever come across in the history of ever, but all of the guys this summer squatted, and did so quite well. I’m with you Mike. Everyone should do some type of squat. I think Mike uses split squats rather than bilateral squatting with his athletes. Correct me if I’m wrong. Great cue I used with an average height lifter while squatting after reading it here last week. He had been starting in neutral posture but reaching into anterior pelvic tilt in the hole. This helped him stay neutral and stacked throughout the movement. Great stuff! It seems this article suggests that the ultimate goal with basketball players is to get them to perform a high bar squat. I can see the reasoning behind high bar. Activate the quadriceps thus strengthening them to help increase their absorption of force. However, I wager that a low bar squat would be more beneficial. You get activation of the quadriceps (and if you disagree, how specifically are you not activating the knee extensors when ascending from a squat? ), but you also activate the posterior chain (i.e. Glutes, Hamstrings, Adductors). Since you’re activating significantly more musculature, you’re improving lower body force production/force absorption as a whole instead of focusing on just your anterior leg. And if it’s anthropometry you’re worried about, someone with long femurs (such as tall basketball players) will low bar squat with a more vertical torso. As long as the barbell is balanced over midfoot, relative bone lengths should not play a role. Overall, interesting article.